If you ask me the most comfortable and frequently used equipment in my kitchen, my answer would be the kadai. It can be easily handled and helps for cooking recipes quickly and evenly. Wait! you aren't familiar with the name 'Kadai'? Go ahead to know about it. Kadai/kadhai/karahi is nothing but a thick, deep, bowl shaped cooking pan with two curved handles, which is widely used in Indian cookery. It is made up of cast iron. Few traditional recipes like Kadai chicken, Kadai Paneer and Kadai Vegetables take the name from the kadai as the recipes were cooked in it. The kadai cooking is quick as there is no water used in it. Because of this, the kadai recipes are mostly dry but sometimes it is cooked in tomato based gravy. Since a long time, dishes prepared in this way are served in a miniature kadai/karahi with hot coal underneath it. This symbolically represents that the dish is fresh from kadai. Also it is important that one need to consume the dish immediately to enjoy its complete taste. Here, I am blogging my version of Kadai Paneer which I love to have anytime a day. 1) Blend tomato with red chilli powder and coriander powder. Keep this paste aside. Using roasted coriander seeds instead of coriander powder will give best results. 2) In a wok, heat 1/2 tablespoon of oil and fry paneer till all the sides are golden brown. Transfer them to a plate. 3) In the same pan, add remaining oil. When the oil is hot, take cumin seeds and crush these seeds with your palm and add them to the hot oil. Allow the seeds to crackle and burst. 4) Add onions and fry till they are soft and translucent. 5) Add ginger garlic paste and fry for a minute. 6) Add the tomato paste (as said in step 1) along with salt, garam masala and turmeric powder. Cook the sauce till the raw smell of tomato disappears. When it starts to thicken, you can see the oil separating from the dish on the walls of wok. 7) Now, add the cubed capsicums and paneer. Mix well. 8) Cook for 5-7 minutes by stirring occasionally. Make sure to avoid burning the sauce. 9) Crush kasoori methi with your palm and add them to the gravy. Mix well and cook for another 3-4 minutes. Ensure that capsicums are crisp so as to retain its shape without changing colour. Taste and adjust the spice level. 10) Garnish with coriander and serve hot with roti. We usually have it with a spicy roti. 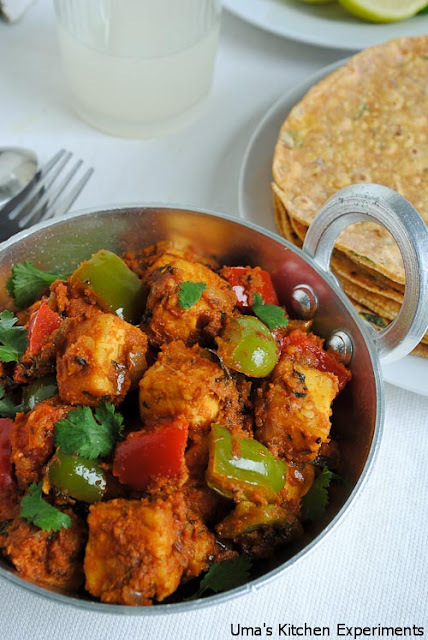 1) To get a gravy kind of kadai paneer, increase the tomato quantity. 2) I usually fry capsicum by adding them when paneer turns slightly brown colour(mostly at the end of frying paneer) and toss them for two minutes. This helps to maintain a crispy and shiny capsicums for the recipe. If you do so, reduce the cooking time after adding to the tomato sauce/gravy. 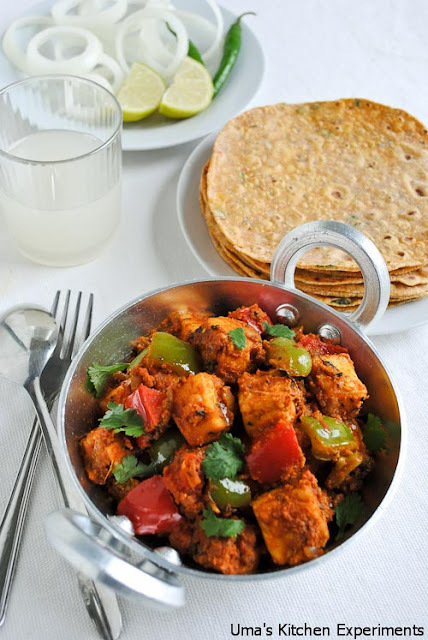 Thanks a lot for sharing the recipe of kadai paneer in a step by step method. Looks simply delicious and mouthwatering. great recipe. Would love to give this a try!! Loved the step by step description with pictures! Beautiful mouth watering clicks .. cant take my eyes off it makes me drool..
That's a great way of presenting. Nice Paneer recipe. The masala has got the perfect color & looks super tasty!! 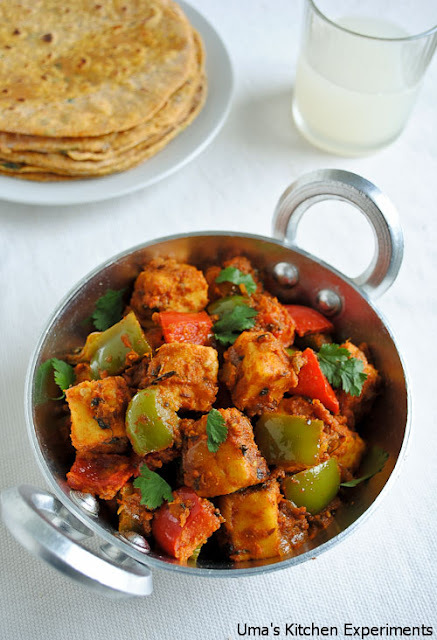 I love kadai paneer and frying with paneer the capsicum is a nice tip. Will try next time, when I make this superb looking dish. Lovely combo with parathas..n as always lovely tempting presentation!! Love the paneer dish with that stack of rotis. 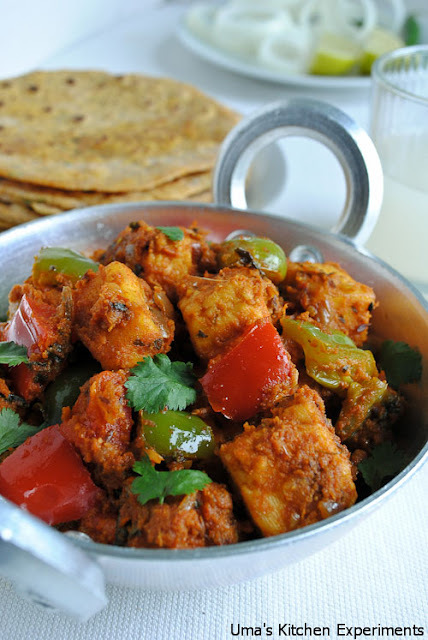 kadai paneer looks so yum...nice recipe Uma !! nice recipe... how to clean aluminium kadhai burns?